Without a doubt, New Jersey’s oldest, most enduring, and important pieces of folklore is the tale of the infamous Jersey Devil. For close to three hundred years now, Jerseyans have told tales of this mythical beast that stalks the Pine Barrens and terrorizes local residents. The recurring nature of this story begs a few questions: Why have New Jerseyans embraced this legend so steadfastly, and above all others? Is there actually some sort of creature roaming the Pine Barrens of Southern NJ, and if so, what in God’s name is it? Mother Leeds went into labor a few months later, on a tumultuously stormy night, no longer mindful of the curse she had utter previously regarding her unborn child. Her children and husband huddled together in one room of their Leeds Point home while local midwives gathered to deliver the baby in another. By all accounts the birth went routinely, and the thirteenth Leeds child was a seemingly normal baby boy. Within minutes however, Mother Leeds’s unholy wish of months before began to come to fruition. The baby started to change, and metamorphosed right before her very eyes. Within moments it transformed from a beautiful newborn baby into a hideous creature unlike anything the world had ever seen. The wailing infant began growing at an incredible rate. It sprouted horns from the top of its head and talon-like claws tore through the tips of its fingers. Leathery bat-like wings unfurled from its back, and hair and feathers sprouted all over the child’s body. Its eyes began glowing bright red as they grew larger in the monster’s gnarled and snarling face. The creature savagely attacked its own mother, killing her, then turned its attention to the rest of the horrified onlookers who witnessed its tempestuous transformation. It flew at them, clawing and biting, voicing unearthly shrieks the entire time. It tore the midwives limb from limb, maiming some and killing others. The monster then knocked down the door to the next room where its own father and siblings cowered in fear and attacked them all, killing as many as it could. Those who survived to tell the tale then watched in horror as the rotten beast sprinted to the chimney and flew up it, destroying it on the way and leaving a pile of rubble in its wake. The creature then made good its escape into the darkness and desolation of the Pine Barrens, where it has lived ever since. To this day the creature, known varyingly as the Leeds Devil and the Jersey Devil, claims the Pines as its own, and terrorizes any who are unfortunate enough to encounter it. 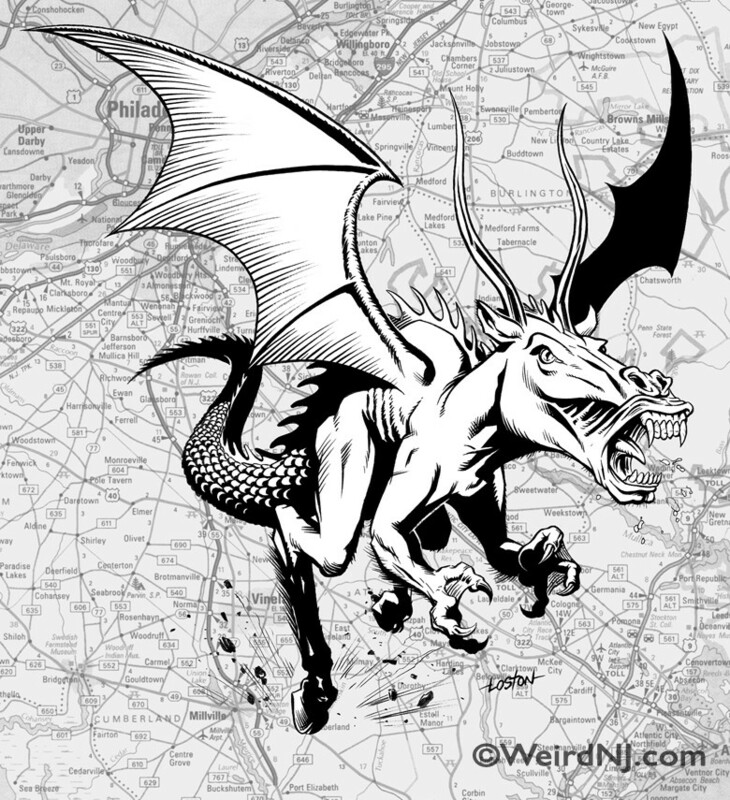 In 18th and 19th centuries the Jersey Devil was spotted sporadically throughout the Pine Barrens region, frightening local residents and any of those brave enough to traverse the vast undeveloped expanses of New Jersey’s southern reaches. Unearthly wails were often reported emanating from the dark forests and swampy bogs, and the slaughter of domesticated animals would invariably be attributed to the Phantom of the Pines. Over the years the legend of the Leeds Devil grew, occasionally even overstepping the boundaries of its rural Pine Barrens haunt to terrorize local towns and cities. The most infamous of these incidents occurred during the week of January 16 through 23, 1909. Early in the week reports starting emerging from all across the Delaware Valley that strange tracks were being found in the snow. The mysterious footprints went over and under fences, through fields and backyards, and across the rooftops of houses. They were even reported in the large cities of Camden and Philadelphia. Panic immediately began to spread, and posses formed in more than one town. Fear and intrigue grew even greater when it was reported that bloodhounds refused to follow the unidentified creature’s trail in Hammonton. Schools closed or suffered low attendance throughout lower NJ and in Philadelphia. Mills in the Pine Barrens were forced to close when workers refused to leave their homes and travel through the woods to get to their jobs. Eyewitnesses spotted the beast in Camden and in Bristol, Pennsylvania, and in both cities police fired on it but did not manage to bring it down. A few days later it reappeared in Camden, attacking a late night meeting of a social club and then flying away. Earlier that day it had appeared in Haddon Heights, terrorizing a trolley car full of passengers before flying away. Witnesses claimed that it looked like a large flying kangaroo. Another trolley car-full of people saw it in Burlington when it scurried across the tracks in front of their car. In West Collingswood it appeared on the roof of a house and was described as an ostrich-like creature. Firemen turned their hose upon it, but it attacked them and then flew away. The entire week people reported that their livestock, particularly their chickens, were being slaughtered. This was most widespread in the towns of Bridgeton and Millville. The marauding misanthrope reappeared later in the week in Camden, where a local woman found the beast attempting to eat her dog. She hit it with a broomstick and it flew away. 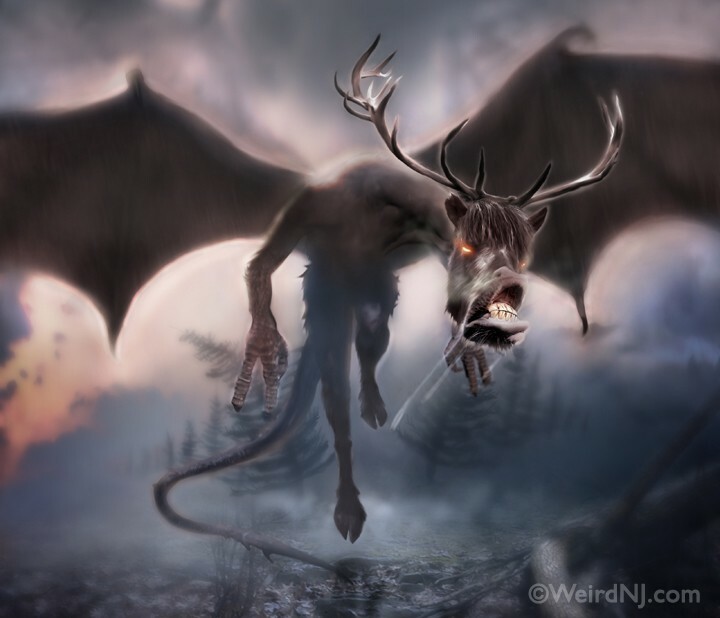 While there has not since been another week to match the frequency, fervor, and intensity of the January 1909 rampage, numerous sightings of the Jersey Devil have continued to be reported to this day. The tale of the Devil has spread beyond the Pine Barrens and has been embraced by all of New Jersey, even to the point where it has been largely commercialized. The Devil is portrayed in toys, on t-shirts, and is even the subject of his own feature film. Most famously, the Devil has lent its name to New Jersey’s NHL hockey team. There are still many, however, who believe that the Jersey Devil is a very real, very dangerous creature. There has been a constant stream of reports over the years of Devil encounters. Most often, people report finding strange, unidentifiable tracks in the sandy soil in desolate areas of the Pine Barrens. Some reports claim that they are the footprints of a strange bird. Others say that they closely resemble hoofprints, although whatever it is walks on just two legs. There have even been a substantial amount of reports that describe the tracks as being cloven, a well-cited description of the feet/hooves of a more famous Devil–Satan. 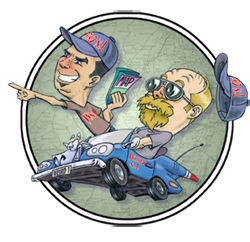 While less frequent, there are still occasional reports of people who see more than just tracks and manage to catch a glimpse of ol’ JD himself. He is most commonly described as having the body of a kangaroo, the head of a dog, the face of a horse, large leathery wings, antlers similar to those of a deer, a forked reptilian tail and intimidating claws. 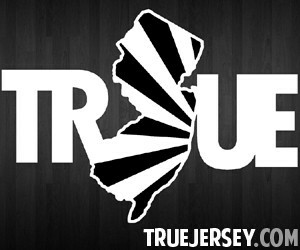 While some Jerseyans embrace their Devil as nothing more than a quaint figment of our collective imagination, a source of unification and pride, and a unique and important piece of NJ folk culture, others see it as a very real creature and a threat to their safety. Still others who have sworn they did not believe in the existence of the Jersey Devil have had their minds changed after spending just one moonlit night in the Pine Barrens. There, where a ghostly mist drifts across the cedar swamps and the unearthly cry of some unseen creature can be heard piercing the stillness of the dark forest, few disbelievers can be found. Whether its deep in the Pine Barrens or deep in our collective unconscious, one thing is certain–the Devil still lurks in New Jersey, and most likely always will. This has haunted me since it happened in 1972. I was a senior at what was then Glassboro State College. 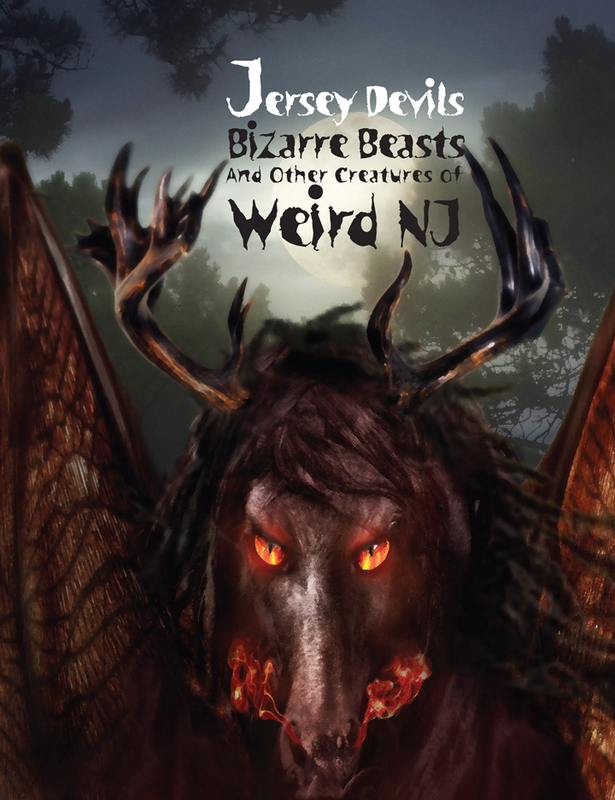 I had heard about the Jersey Devil when I came to South Jersey, but being from North Jersey (a different world) I thought I was far too sophisticated to believe in such humbuggery. One winter night, I was driving to Glassboro from Blackwood on Greentree Road. At the time the road was flanked by orchards and farms. There were few houses and there was hardly any development. I was completely sober and awake when I caught a glimpse of something in my rear-view mirror. Curious as to what it could have been, I slowed down to take a gander. It was dark out, but moon lit enough that I had no trouble at all discerning the upright figure of a creature crossing the road from one side to the other roughly twenty five feet behind my car. The figure stood taller than a man by far, and had thick haunches (similar to a goat’s) supporting its nearly human looking torso and huge wooly head. It moved heavily and didn’t seem at all disturbed by my being there. Don’t Ever Camps in the Pine Barrens Alone! I spent a lot of time in the Pine Barrens when I was growing up in NJ, and had my share of strange experiences. When I was about 13, I went camping alone near Hampton furnace. I had a bow with me and went looking for a rabbit dinner about an hour before sundown. Something started following me back in the trees. It tailed me back to my camp and circled while I cooked my dinner. This kept up until about two hours after dark–and let me tell you, it was one dark night. I finally decided that my visitor had moved on and crawled into my tent. When I just started to calm down, I heard a foot stomp down right behind the tent. I got all set to jump out when this thing (whatever it was) started screaming! I would compare the volume of the scream to a large truck’s horn. I couldn’t decide what to do. I had my bow and knife, but they didn’t seem like much. After several blasts it just stopped. I didn’t hear a sound except my heart for about an hour. As a native of Cape May County, I’ve had the typical right-of-passage trip to the Pine Barrens, the legendary home of the Jersey Devil. This Jersey girl went to Cape May County Technical High School, which sponsored trips to the Pine Barrens for good grades in certain classes. I was one of the fortunate students to go three times during my four-year career at CMCT. Each time I went on this trip, my canoe was followed by a heavy-footed “thing.” With each step I heard branches snap under its feet (hooves?). Every ten minutes or so I could hear deep beastly growls that to this very day give me the creeps. Being in a canoe and on a class trip didn’t afford me much opportunity to flee in terror, so I stuck it out–for three years. Every year it was the same. During my sophomore year I was pretty confident about my canoeing skills, so I didn’t look over my shoulder much. I went canoeing with a friend of mine when we came across a bag that had been torn open and gone through. Around it were prints on the ground that looked something like a horse’s hoof, only bigger. Then I heard it, the cry that still haunts my dreams: part human, part beast, and full of anger, pregnant with pure hate. I nearly flipped the canoe! We left, leaving whatever it was out there behind–or so I thought. It seemed to follow us. Every time we stopped or paused, it got closer to the river. We pushed on. Then worse came to worst, as we tipped the canoe. I heard the thing running behind us, and thought for sure we were dead. Then we righted our canoe and got into it as fast as humanly possible. We finally made it out to safety, sun-fried to a crisp, missing all of our valuables and most of our clothes, but never happier to be on shore. We packed up our bus, and left. Let me tell you of a sighting of the Jersey Devil. I was driving up Route 9 in Bayville at around 10:00pm. There were two cars in front of me and we were traveling about 35 mph. To the right of Route 9 is a mini-mall type building with woods behind it. To the right is all woods. All of a sudden I saw this BIG thing running across Rt. 9! It looked like one of the classic pictures of the Jersey Devil. It had no tail, no fur, its ribs showed, and it had a long odd head with short ears that laid flat. It looked almost 10 feet tall! I noticed it because the first car stepped on its brakes, as did the second car. When I looked ahead I saw this thing galloping across Rt. 9 and straight into the woods. I was not really scared because it did not register yet. I stopped to mail something in the mailbox, about 300 feet from the main road, and I saw a child’s shirt, shorts and one sneaker lying on the ground! I mailed my letter, ran into my car and laid rubber all the way home! I was certain that I had seen the Jersey Devil. No one believes me. They say it was a deer. I have never seen a “deer” that big, that fast, or that weird looking in my life. What is really creepy is that the other two people driving in front of me stepped on their brakes, so they must have seen it too. –Sonny Z.
I actually have two stories about the Jersey Devil. The first one is my own experience. As a little kid, my parents took my family camping every summer around the Pine Barrens. One night, as we all slept in a big tent, I woke up to the sound of what to me was like a woman screaming. It was a bloodcurdling scream over and over again but I was the only one awake. I thought, being the naive child I was, that a woman was being attacked by a wolf. I don’t know where I got that conclusion, but it must have been from the screams. No one believed my story, ever. As I got older I became more interested in the Jersey Devil legend. Many of the stories were people talking about the screams they hear in the Pines at night. As they described them I got chills because I knew what they were talking about. According to the Asbury Park Press of October 1988, a man who lived in Howell Township encountered the Devil in 1981. He described the creature as having a furry body, huge feet with three toes on each one, large teeth, and stood about six feet tall. Alan Macfarlane, Chief Ranger of the Wharton State Forest for over 20 years relates a story that happened in 1980: He had gone to a farmer’s house near Jenkins, where he came upon four pigs that were lying dead close to their pen. The back of their heads had been eaten out and there were scratches all over their bodies. There were no tracks or blood on the ground. The ranger had no explanation of what had happened. In the late 1980’s a couple of my friends and I took a camping trip to the Pine Barrens. I was unaware that we were headed to the home of the Jersey Devil. We headed out on our bikes, and did our share of partying that night. The next day while everyone was asleep, three of us decided to hit the trails a bit earlier than usual. We were about 100 yards away in the woods, when my bike stalled out. I looked and found that my friends had stalled also. At first I thought it had something to do with the terrain or maybe something to do with the nearby power plants. Fifty feet away from each other we tried to start up our bikes, when suddenly from the woods we heard the most horrible piercing scream. It sounded inhuman, like something being tortured. Once back at camp they asked us if we had heard screams earlier. They had heard them too, four miles away. That night we headed into the local town because we ran out of booze. We went into a bar and I ordered a drink, still in shock from what I had heard that morning. The bartender asked, “Hey kid, whad’dya see a ghost or somethin’?” After I told him the story he smiled and said, “It looks like you met our little friend.” He then asked us to come out back. He showed us a tin garbage can that was shredded to bits. It looked like the shreds were made from something with three claws. I have never returned to the Pine Barrens since, and I do not plan to go back. 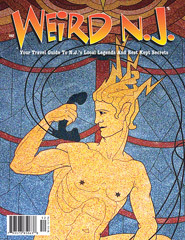 –Frank T.
Read more tales of encounters with the Jersey Devil in Weird NJ (Volume I). Weird NJ’s video documentary on the Jersey Devil. This entry was posted in Bizarre Beasts, Stories and tagged Jersey Devil, Mother Leeds, Pine Barrens. Bookmark the permalink.